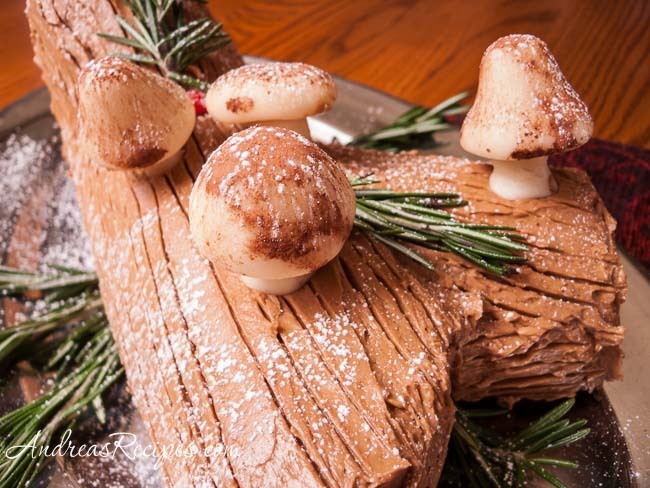 The Daring Bakers got all festive this month and tackled the traditional Yule Log (aka Buche de Noel). Our beloved founders Lisa and Ivonne chose this challenge for us all, and it was a big challenge for me on several levels: marzipan, because I’ve never done it and I’m not an artist; genoise, because it always separates on me; rolling a cake, because it’s also something new and I had visions of broken cake horror dancing in my head; buttercream made with egg whites, another something new to tackle; and finally just finding the time to make the cake and write this post while managing the three ring circus. I wasn’t shaking in my boots, but I seriously studied the recipe and tried to read everything I could find on the subject of making yule logs. I found a video that demonstrated how to roll the jelly roll on Epicurious.com, and watching that was very helpful for this jelly roll novice. The recipe comes from Perfect Cakes by Nick Malgieri (the genoise and the buttercream) and The Williams-Sonoma Collection: Dessert (the mushrooms). Food Network also has the cake recipe online because Malgieri was on Sara’s Secrets in 2002 and made buche de noel. Check out the Resources list below for links to the recipe as well as Sara’s planner for the cake. 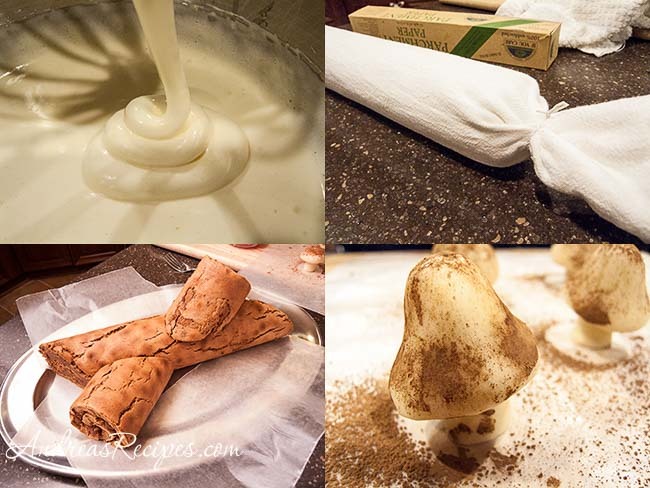 And just for fun, I tossed in a link to a Buche de Noel Glace recipe from Alice Medrich in case the weather is warm in your part of the world and you want to do a frozen yule log instead. Because this was a holiday challenge and I was feeling a bit daring, I decided to make it for a holiday party we were hosting on the 16th, but Murphy’s Law took over and we had some sick, contagious children and had to cancel the party. So this weekend was my last chance to make it, and I tried like heck all day Saturday to get going, but once again fate was not on my side and I didn’t even get started on the genoise until 8:30 pm. I thought for sure I would not be able to get this done and began to think we would have to watch the yule log instead of eating one. I was in for a long night so I conscripted Michael and set him to the task of making marzipan mushrooms. He made an excellent sidekick and even played kitchen elf and cleaned up while I wrote this post! So I’ve crowned him an unofficial Daring Baker. Made a chocolate cream cheese filling. We had planned to add chopped hazelnuts in the filling, too, but we were struggling with the cake and forgot to add them! I learned a few things during this challenge and I even emerged victorious with my genoise this time. It didn’t separate and the cake was quite yummy. Yay! The cake cracked and looked quite rustic after unwrapping it, but the buttercream hid the faults well. The chocolate cream cheese filling was decadent, but I followed the recipe exactly and it turned out to be too thick for this application. Genoise is sticky and the filling just glued on to it and wouldn’t spread. I tried warming the knife in the cooktop flame, but that wasn’t enough. A chocolate and cream ganache would probably work well since you could just pour it on. I missed the flavor of the toasted hazelnuts and would definitely want to add those to the filling. Making a small recipe of marzipan was plenty for us. We had five mushrooms, and they took up plenty of space on the log. With more time and practice I could be convinced to try some other little marzipan decorations. Assembling the pieces of the log wasn’t too bad, though a couple of strategically placed toothpicks definitely help hold the cake together. We love, love, love the mocha buttercream. I could put some of that in a bowl with a little whipped cream swirled on top and have that for dessert any time of the year! Fortunately there was a little left over for us to indulge. I want to send a huge thanks and holiday hugs to Ivonne and Lisa for starting us off a year ago. They had no idea that their little experiment with pretzels in November 2006 would snowball into an international virtual baking group, and they’ve done a wonderful job of managing all of us crazy bakers. And I also need to send hugs and thanks to Mary, Peabody, Helene, and Breadchick for all the help they give. Merry Christmas to all The Daring Bakers! Adapted from Perfect Cakes by Nick Malgieri and The Williams-Sonoma Collection: Dessert. 1. Set the rack in the middle of the oven and preheat to 400° F.
2. Fill the 2-quart sauce pan halfway with water. Bring to a boil and then reduce heat to a simmer. 3. In the bowl of the stand mixer, whisk together the eggs, egg yolks, sugar, and salt. Set the bowl over the pan of simmering water and stir gently until the mixture reaches about 100 degrees or feels just warm to the touch. Remove from heat. 4. Using the whisk attachment, whip on medium-high speed until the egg mixture is cool to the touch and triples in volume. The egg mixture should be thick and make a ribbon as it drips off the whisk back into the bowl. 5. In the small bowl, stir together the flour, cornstarch, and chocolate. Sift 1/3 of the dry ingredients over the egg mixture. Using a spatula, fold in the flour. Make sure you get all the way to the bottom of the bowl and pull up any of the flour mixture. Repeat with another third of the flour mixture, and then with the last of the flour. There should be no dry lumps or specks. 6. Pour the batter into the prepared pan and smooth the top so that the cake is distributed evenly throughout the pan. 7. Bake for 10 to 12 minutes. (Start making the filling.) The cake should spring back when touched and a tester should come out clean. Make sure it does not cook too long because it can dry out, making it difficult to roll. Remove cake from oven and allow it to sit in the pan on a wire rack. 1. In the bowl of the stand mixer (paddle attachment), mix together the softened cream cheese and the sugar at medium speed until it is creamy. 2. Make sure the melted chocolate has cooled. Add it to the cream cheese mixture and mix at medium speed until the chocolate color is even throughout. Scrape down the sides as necessary. 3. Stir in the milk and vanilla extract. Add additional milk as necessary to keep the filling from getting stiff. 1. Run a knife around the edges of the pan to loosen the cake. 2. Turn the cake pan over onto a flat surface. Lift away the pan and remove the parchment paper. 3. Lay another piece of parchment nearby and dust it with powdered sugar. Carefully turn the cake over and place it on the new parchment. 4. Gently spread the chocolate cream cheese filling on the cake, staying about one inch away from the edges. 5. Carefully turn over one long edge of the cake onto itself, pressing on the parchment. Continue rolling the cake, using the parchment to keep the cake snug all the way. The cake may crack a little, and that’s ok because you will cover the cracks with the buttercream. 6. Make sure the cake is laying seam-side down. Wrap the parchment around the cake and then wrap in the towel. Gather the ends and tie them up as shown in the photo above. Place on a sheet pan in the refrigerator and chill for several hours or overnight. Preparation – Buttercream (Prepare up to 2 days in advance and refrigerate. Return to room temperature before decorating the cake.)1. In the 2-quart sauce pan, add water to about half full. Bring to a boil then reduce heat to a simmer. Dissolve the espresso powder in the vanilla. 2. In the bowl of the stand mixer, whisk together the egg whites and the sugar. Set the bowl over the pan of simmering water and stir gently until the sugar is fully dissolved and the egg whites are hot. 3. Using the whisk attachment, whip the eggs and sugar until the mixture is cool to the touch. Attach the paddle and beat in the softened butter. Continue beating until the mixture is smooth. Preparation – Marzipan Mushrooms (Prepare up to 3 days in advance and store in an airtight container.)1. In the bowl of the stand mixer (paddle attachment), beat the marzipan and half the sugar on low speed until the sugar is absorbed. Add the remaining sugar and mix it in. It will look like fine crumbs. 2. Add 2 tablespoons of corn syrup and stir until the mixture starts to hold together when pressed with your hands. You may need to add a little more corn syrup, just test the consistency of the mixture as you go. It should still feel dry and crumbly, not sticky. 3. Knead the marzipan on a sheet of wax paper until it is smooth. If the marzipan is still crumbly, you can dip your fingers in a little corn syrup and continue kneading. 4. Roll the marzipan into a cylinder and cut into 1-inch lengths. Roll half of the pieces into balls and shape like mushroom caps. Take the remaining pieces and form bases of the mushrooms and press the caps and bases together. 5. Smudge the mushrooms with a little cocoa powder. Final Assembly1. Remove the cake from the refrigerator and unwrap it. Using a sharp knife, cut away the two ends on a diagonal starting about 2 inches from each end. 2. Place pieces of wax paper on the serving plate. Lay the large piece of log on the wax paper. Place one of the cut pieces on top of the log and hold in place with two toothpicks. Push the toothpicks in deep so that they are not visible. Lay the other cut piece alongside the log. 3. Spread the buttercream all over the cake, including the exposed ends and the bumps. Spread the buttercream in long strokes. Use a fork to draw lines in the buttercream resembling bark. 4. Carefully pull away the wax paper and place the rosemary sprigs and red hots on the cake and tuck some rosemary sprigs around the plate. Place the mushrooms on the cake. Dust the cake lightly with some powdered sugar to look like snow. You decorated it so beautifully, really like the shape too. I just love your mushrooms! Your log looks amazing. Happy Holidays! 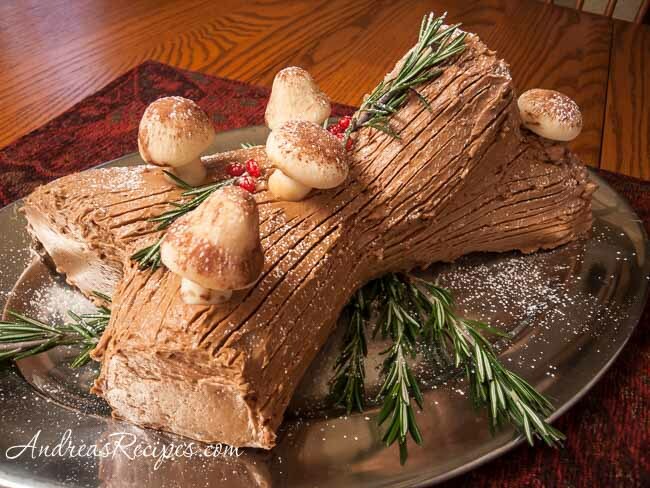 A beautiful Yule Log and I love the chocolate cream cheese filling! Yum! Love the way you positioned the log! Great job, glad you could make it. Merry Christmas! Wow, that does not look like a recipe for the faint of heart! It is incredible, truly, incredible. My compliments to the chef. And I gotta say, Michael kicked some mushroom heiny – they look fantastic! Andrea, what perfect mushrooms you have there and the perfect helper too! And your buttercream hides the cracks so well, what is a good log without some cracks I ask you. I love the way everything turned out for you, The layout of the branches, mushrooms,etc. Merry Christmas and Happy New Year. Congratulations… you took on a lot of “firsts” with this one, and your end result is absolutely amazing. I love your photographs; the batter ‘ribbon’ predicts a sensational genoise to come and your mushrooms are simultaneously whimsical and realistic. Merry Christmas to you and your loved ones, and best wishes for a new year filled with love and laughter! I love the way you decorated it and the mushrooms & toadstools are just adorable! That’s one great looking bûche de Noël. What an elegant log you made! Nice work! Your marzipan mushrooms look so cute. Very handsome log! Sorry about your party — I hope the kids are better. Thanks for the video link — helpful tips for next time I make it. 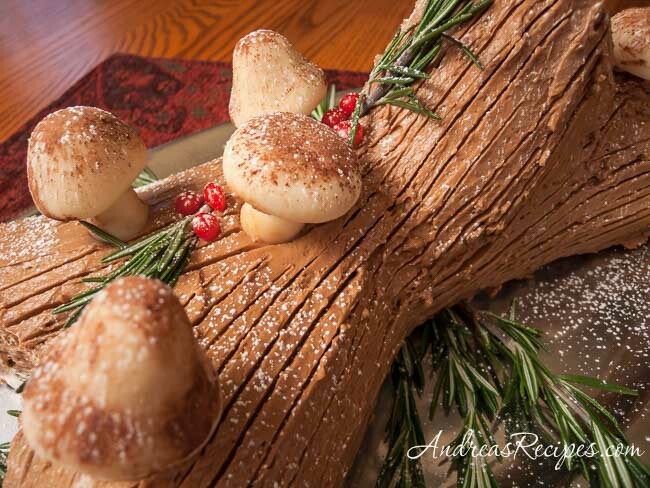 Your log looks wonderful and those marzipan mushrooms are very dainty! Look at those mushrooms. Great looking log Andrea. Andrea, I love your yule log. The way you made it look like two crossed is wonderful! Great job! You’ve inspired me for next year. That is such a pretty yule log! I think the mushrooms are to die for!! What an excellent job on this month’s challenge 🙂 Happy new year! I got one of those KE (Kitchen Elves) too…what a fie team you both make! The final product turned out perfect and I love the flavors you chose! Hope you had a great Christmas! Great looking log – very artistic! The mushrooms look so realistic. i just did this recipe on the 25th and it was AmAZING!!! i have never made a bouche de noel before, i watched the video on rolling the cake, went off without a hitch. i did use a mousse filling instead of the cream cheese filling you did (martha stewart) and i made french meringue mushrooms instead of marzipan, not a big fan of marzipan! beautiful recipe! thanks again!! !